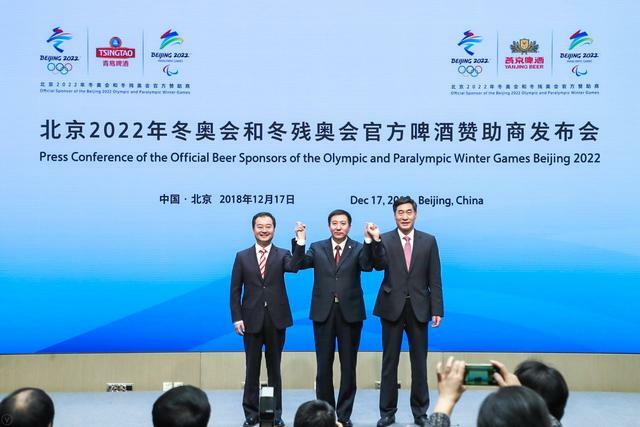 Tsingtao Brewery Co., Ltd. and Beijing Yanjing Brewery Co., Ltd. became the Official Beer Sponsors of the Olympic and Paralympic Winter Games Beijing 2022 on 17 December 2018. The two leading beer companies in China are the first Official Sponsors that Beijing 2022 signed since it began looking for these tier-two sponsors in August 2018. Zhang Jiandong, Vice Mayor of Beijing and Executive Vice President of Beijing 2022, joined executives of Tsingtao and Yanjing at a news conference to announce the partnerships. Zhang and the executives unveiled composite logos that combine each of the two companies’ trademark with Beijing 2022 emblems. Both Tsingtao and Yanjing were Official Beer Sponsors of the Olympic Games Beijing 2008. The two companies will share marketing rights in the beer category for Beijing 2022 in a similar “co-exclusive” arrangement. Han Zirong, Secretary General of Beijing 2022, lauded Tsingtao and Yanjing for “taking a further step” in partnering with the Olympics, after contributing to the success of Beijing 2008. Tsingtao is headquartered in the scenic coastal city of Qingdao, where the sailing events of Beijing 2008 took place. This second chance to serve the Olympics is a testimony to Tsingtao’s strength as a company with more than a century of brewing history, said Huang Kexing, Board Chairman of Tsingtao Brewery Co., Ltd..
“Tsingtao is happy to be joining hands with Beijing 2022 to leave the world with great Olympic memories once again,” Huang said. As a company from Beijing, Yanjing looks forward to growing with the Olympic and Paralympic Winter Games to be hosted here, said Zhao Xiaodong, Board Chairman of Beijing Yanjing Brewery Co., Ltd..
“Yanjing will stick to even higher standards, and spare no effort to supply Beijing 2022,” Zhao said. Beijing 2022 is expected to bring on board more tier-two Official Sponsors in the coming months.